Sichuanese dried fried green beans. i.e. 'gan bian si ji dou' 干煸四季豆, are delicious with rice or just with beer. 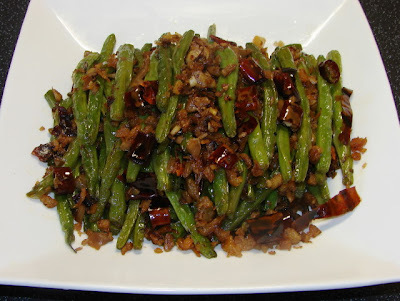 The beans are tender sweet and a bit spicy with yummy salty bits of dried shrimps and Sichuan preserved vegetable (zha chai). Many recipes like to add minced pork (ground pork) I find it unnecessary. The beans are fried in oil then stir fried. You may be disgusted how oily it can be, but I have a way to remove most of the oil so it is not too bad. Without frying in oil you won't get the authentic taste and texture of the beans. Here is how I make this if you are interested. about 50g pc of Sichuan preserve vegetable (zha chai), finely chopped then rinse with water. Drain and give it a light squeeze to remove salty excessive water. After rinsing the beans, make sure to shake off as much excess water as possible. This will prevent oil spitting. Remove all the beans straight onto a large metal sieve/colander. Immediately rinse with warm tap water to remove as much oil sticking on the beans as possible. Shake to remove excessive water. Put on one side. Remove frying oil. Leave one tbsp of the frying oil or use fresh oil. Heat then add in all the garlic. chilli, dried shrimps and preserved vegetable. Dry fried for few minutes till very fragrant and the bits are turning slightly browner. Add in the fried beans. Stir on high heat to remove excess water moisture. Add dash of soy, vinegar and dash of cooking wine. Not too much soy the preserved vegetable and dried shrimp can be quite salty. Stir till all combined. Ready to serve hot or warm. Ah, the Sichuanese and their penchant for oil! I love these beans so will definitely give it a go. I have been mad about this dish ever since I lived in Beijing for 3 months a few years ago. (Yes, I realise it isn't a Beijing recipe, but I ate them often there.) I just tried your recipe and it was EXACTLY the way I remembered them. YUM!!! Thanks SO much.